Thank you to Riverhead Books and Goodreads for sending me an advanced copy of Gold Fame Citrus. It's fun to get your hands on a book before it hits the shelves. "In a parched southern California of the near future, Luz, once the poster child for the country’s conservation movement, and Ray, an army deserter turned surfer, are squatting in a starlet’s abandoned mansion. Most “Mojavs,” prevented by armed vigilantes from freely crossing borders to lusher regions, have allowed themselves to be evacuated to encampments in the east. Holdouts like Ray and Luz subsist on rationed cola and water, and whatever they can loot, scavenge, and improvise. For the moment, the couple’s fragile love, which somehow blooms in this arid place, seems enough. But when they cross paths with a mysterious child, the thirst for a better future begins. Immensely moving, profoundly disquieting, and mind-blowingly original, Watkins’s novel explores the myths we believe about others and tell about ourselves, the double-edged power of our most cherished relationships, and the shape of hope in a precarious future that may be our own." Before I start my review, I just have to confess that while I try not to judge books by their covers, that does not mean that they don't grab my eyes and that I don't appreciate them. Isn't the foil cover lovely? OK, I did not finish reading this book. It's an interesting premise--struggling to survive in a drought-ridden world--but the main character, Luz, was very passive and dependent upon her male paramour for absolutely everything. I had no desire to follow her story any further. I like strong female characters: they can be complicated, make mistakes, or even be the villains, but if they are passive and resigned to be weak, no thank you. I was also put off by romance immediately taking center stage in the plot. As readers of Jactionary know, I do not tend to enjoy contemporary romance novels. In young adult novels, if the romance is secondary it's more welcome. 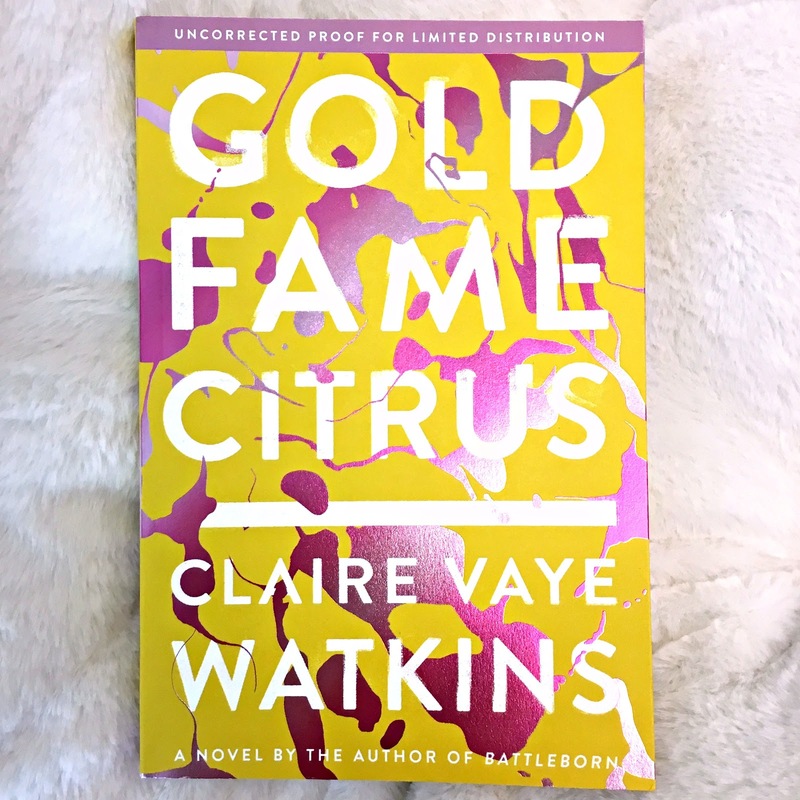 Gold Fame Citrus isn't marketed as a romance so this threw me and ultimately acted as strike two in why I set it aside. Having not finished it, maybe things shift in the plot later on, I don't know. I do have a couple of friends who really liked the novel, but I just wasn't the right audience for it.